Elizabeth Seton Center, an apostolic work of the Sisters of Charity of Seton Hill, is grounded in the tradition of human service handed on by Saint Vincent de Paul and Saint Elizabeth Ann Seton. Seton Center’s intergenerational programs are based on the belief that no matter what age we are, growing and learning are lifelong activities. People of all ages are bound together by what they share. Social service ministries provided at Seton Center, including child-care, music and theater, ombudsman and senior services, are helping to meet the needs of our changing world. This is especially true of the Adult Day Services program serving the ever-growing adult population. Seton Center facilities in Pittsburgh and Greensburg both offer Adult Day Services, a program that enhances the lives of elderly family members and their caregivers. Both locations provide a safe, secure "home away from home" for senior citizens who cannot stay by themselves during the day. Family caregivers have peace-of-mind and the freedom to attend to their work, relax and recharge, or meet other personal needs in knowing that their loved ones are in a safe environment. 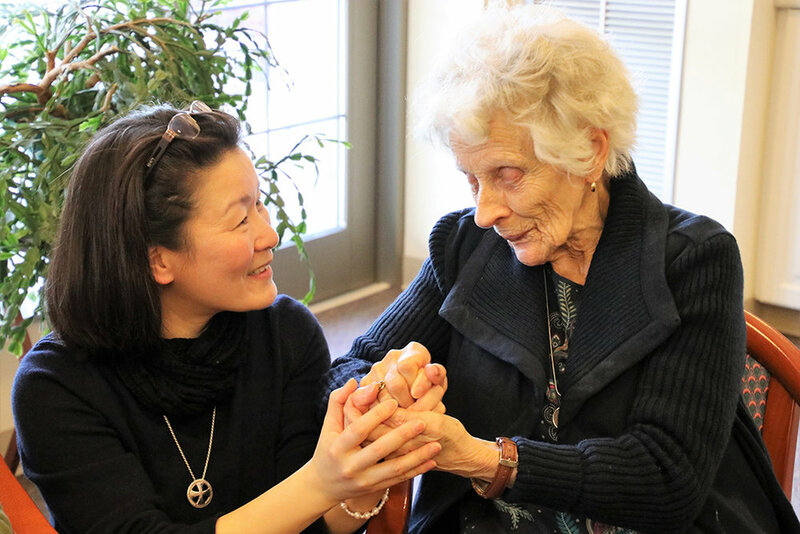 Now in the second year of her novitiate, Sister of Charity Hyeon Lee has ministered to adult day care clients at both sites. Seeing God in every client she works with, Hyeon was moved to say, “I love them, but I receive more love from them! Even with dementia, Parkinson’s disease, or physical pain, they always move me by their smiles and love.” At the Pittsburgh location, where child care is also offered, Sister Hyeon has also been privileged to witness the joyful interaction between the children and the seniors served by their respective care programs at Seton Center. Adult Day Services clients enjoy socialization with their peers and the loving staff members who care for them. Days are filled with activities customized to client needs and wishes, including crafts, cards, field trips, entertainment, exercise, and educational classes. Nutritious lunches are provided and a nurse capable of administering medications is on site to monitor medical needs. Physical, occupation, and speech therapists visit regularly. The staff encourages those in their care to function on a self-directed basis in order to build confidence and promote self-esteem. Seton Center facilities are clean, cheerful, comfortable, easily accessible, and are an excellent alternative to full-time assisted living facilities. The Adult Day Services programs are licensed by the Pennsylvania Department of Aging, and are part of the Pennsylvania Adult Day Services Association and the Adult Day Services Network. Family members and caregivers may discuss individual needs and the outstanding services Seton Center offers at an affordable cost by calling 724-832- 2810 in Greensburg (adult day care only) and 412-344-4777 (child care and adult day care) for the Pittsburgh location in the Brookline neighborhood. To have a representative contact you, complete a pre-registration form at www.setoncenter.com/html/Miscellaneous/pre_registration.html. The sound of a baby laughing got my head out of the computer. It was 3-month-old Tristan. His mother, who moved into Sisters Place housing two months before he was born, had come to our office to help out. Their visits are really good for our morale. We see in the strong mother-son bond, the obviously healthy baby, the calm, focused parent — the fruits of our labor. At Sisters Place we offer a home and supportive services to homeless single parent families. More than 330 families have moved from our programs into permanent housing since our first family came here in 1997. Last year we helped a total of 53 homeless families including 58 parents and 105 children. This ministry located in Clairton was created by a collaborative of fourteen congregations of local women religious. These Catholic sisters asked themselves in the early 1990s, “What can we do to help the poorest among us?” The answer they discerned was to provide housing for homeless single mothers and their children. Since 2010, five of those single parents have been homeless fathers. Our families come from all over Western Pennsylvania and beyond, from domestic violence shelters, drug and alcohol treatment, homeless shelters, even from empty buildings and from under bridges. There are as many stories about how someone becomes homeless as there are people we’ve served. But the overriding themes are poverty, mental or physical disability, substance abuse, violence and crime, unemployment, mortgage foreclosure, eviction, and illness or death of the main family wage earner. Our aim is to support, encourage, and enable our homeless parents to stabilize, complete education and find suitable employment. Many jobs cannot support a family, even a family of two. But getting a job, any job, is often the first necessary step in the climb out of homelessness. On school days you will find our six- to twelve-year-olds in the After School Program. On summer days you will find them at camp swimming, playing in the fresh air, or on a field trip to the Science Center, Kennywood, etc. These activities allow the children to normalize after the stress of homelessness. For the first time in a long while, they can be children again. We don’t have the words to appropriately thank the people, businesses, foundations, and churches that have supported Sisters Place. Your generosity has allowed our mission to continue in the wake of government funding cuts. While we have wonderful volunteers, we would love to have more. The application process is easy; we pay for the background checks. Our volunteers do everything from childcare alongside our staff, data entry, bulk mailings, and more. Note: Article contributed by Sister Mary Parks, CSJ, Executive Director of Sisters Place , who is pictured. The Felician Sisters are feeding the poor, healing the sick, and educating the next generation in Haiti – the poorest country in the Western Hemisphere—a country where malnourished children go to bed hungry each night. Where many have no clean drinking water. Where cholera, the Zika virus, and malaria plague the people of Haiti. Sister Marilyn Minter and Sister Inga Borko felt compelled to serve, and chose to live among the impoverished and those in greatest need, in total availability to those they would serve. The Sisters’ passionate commitment to the poor and leadership in ministering to the poor has rippled through the region of Jacmel, the site of the Felician mission in Haiti. In six years, the Sisters’ mission has blossomed into a multi-faceted ministry that is helping to break the cycle of poverty by giving opportunity, knowledge, and inspiration to a new generation of Haitians. Their outreach includes the Mother Angela Kitchen offering the children of Jacmel a meal five days a week; a literacy program for women; a clean water program; an educational program for children; and the Mother Angela Mobile Clinic, named after Felician Sister Foundress Blessed Mary Angela Truszkowska. The Felician Clinic brings urgently needed medical care to the people of Haiti living in mountain communities high atop the island. Rocky, dirt roads together with frequent mudslides that wash away the roads make it extremely difficult, if not impossible, for residents to travel down the mountain to receive medical care. Housed in an all-terrain vehicle, the Sisters travel with the mobile clinic to scores of mountain communities several days a week delivering medical care to people who would otherwise have no access to healthcare. Whether through the mobile clinic, the clean water program, or the educational programs that the Sisters provide, the Felician Sisters are teaching the Haitian people the skills they need to become self-sustaining. “Our Felician mission in Haiti is not a disaster relief effort. Ours is a mission to walk with those we serve. It is a mission of hope, one that is life-sustaining and life-giving,” Sister Marilyn added. HOW TO MAKE A DIFFERENCE: To learn more about the Felician Sisters’ mission in Haiti or how you can help to support the Sisters’ Haiti mission, please visit feliciansistersna.org or call 724-384-5303. A Sister of St. Francis of the Neumann Communities, Sister Yvonne Dursh is excited to be a part of St. Anthony School Programs, a Catholic-based inclusive educational environment for children of all faiths with Autism, learning disabilities or Down Syndrome. She works as a teacher’s aide for 11 children in grades three through eight at Blessed Trinity Academy in Glenshaw. The children are part of St. Anthony’s unique inclusive educational program and are mainstreamed with other kids in some classes, but for other subjects, they meet in a special class. 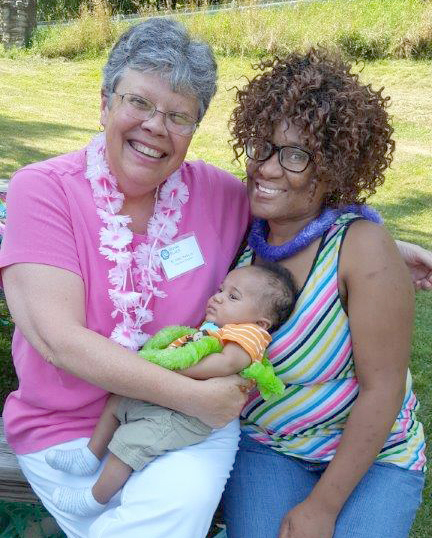 As a lifelong educator, Sister Yvonne has a passion for working with children. She previously worked with children with Autism, obsessive-compulsive disorder, and conduct disorders at Comprehensive Children & Family Services in New Castle. In addition, for 19 years she served with court committed teens at the Youth Development Center in New Castle where she also was chaplain. How to Make a Difference: To learn more about the Sisters of St. Francis of the Neumann Communities, visit www.sosf.org. The Sisters of the Humility of Mary came to the United States in 1864 as a small community seeking to serve God’s people. What they found in their Western Pennsylvania motherhouse, Villa Maria, was a place they could share with all who needed its healing spirit. In the 154 years since the sisters settled in America, they have ministered with many underserved populations, and for the last decade HM Sisters have been working with refugee families as mentors and case workers through the Cleveland Catholic Charities Office of Migration and Refugee Services (MRS). Over the years, the HM Sisters and one of their sponsored ministries, Villa Maria Education and Spirituality Center, have hosted groups of refugee mothers and children from MRS at Villa Maria for retreats and days of rest and relaxation. They come to Villa Maria seeking respite from the demands of a chaotic world and leave with a sense of peace and contentment. And so the sisters continue to open their home and their hearts to those who need it most. HOW TO MAKE A DIFFERENCE: Become an HM partner in ministry and help us continue to bring more abundant life to all of God’s people. Donate online at www.humilityofmary.org/support-us and specify refugees in the gift designation field or contact the HM Development Office at hmdevelopment@humilityofmary.org or 724-964-8920 ext. 3291. The Intersection, founded by Sisters of Mercy in 1972 and in continuous operation at 115 Seventh Avenue in McKeesport, Pa., serves individuals and families who are economically poor, disadvantaged, and having multiple, complex needs. Many persons come who are unable to find help from any other source. The Intersection provides individual support in a number of different ways, each supported by dedicated volunteers, religious and church groups of various denominations, civic organizations, local businesses, and private individuals. Many of those we serve are also volunteers. Intersection provides a hot meal to people who have neither a permanent residence nor adequate cooking facilities. We serve approximately 14,000 meals each year in an atmosphere that is welcoming and reflects our value of reverence for each person. Various church groups and other small groups of friends, or Intersection volunteers, prepare our meals. Guests have a reservation time, choose their own seats, and are served by volunteer “wait-persons.” Whenever possible, guests are given choices, and if a guest cannot eat certain foods for health or religious reasons, alternatives are offered. 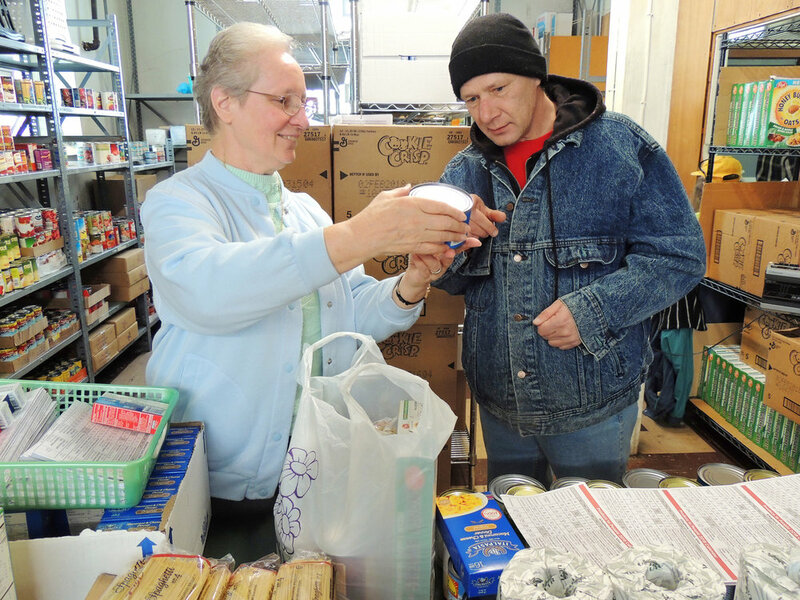 The Food Pantry Club serves income-eligible McKeesport residents. Last year the Intersection distributed over 5,000 food orders to more than 500 families. Food orders include a ‘dry bag’ with items such as canned goods, pasta, cereal; a ‘cold bag’ with milk, eggs and various foods like cheese, yogurt, frozen foods, meat; and a ‘walk-through-bag’ where the pantry member chooses from an assortment of fresh fruit and vegetables, bread, extra canned goods, and packaged foods. Recipes and menus, household goods, paper products, cleaning supplies and other miscellaneous items, also are available to the pantry club families. We distribute household items such as towels, silverware, bedding, blankets, dishes, pots and pans, etc. Around the holidays, new winter items, such as socks and gloves, are available, along with gift cards for food. We provide small grants in emergency situations, or make referrals for specific services. Emergency housing support, like assistance with rent and utilities, is also available. We continue to seek funds for this area because keeping people in their homes reduces homelessness. We offer bus tickets for people to get to medical appointments, court appearances, and agencies that provide basic human services. We also assist the people in getting either a non-driver’s identification card, or renewing their ID at PennDOT. This card is crucial today for any person who wants to acquire a job or rent an apartment. Many believe that the richness and uniqueness of Intersection is in its diversity and inclusiveness, the mingling of guest, donor, and volunteer, the sharing and celebrating of our common humanity. How To Make a Difference: To learn more, engage, volunteer, or donate to The Intersection ministry, please visit www.intersection-mckeesport.org. Note: Article contributed by Bonnie Heh, RSM, a Sister of Mercy and finance director at The Intersection. 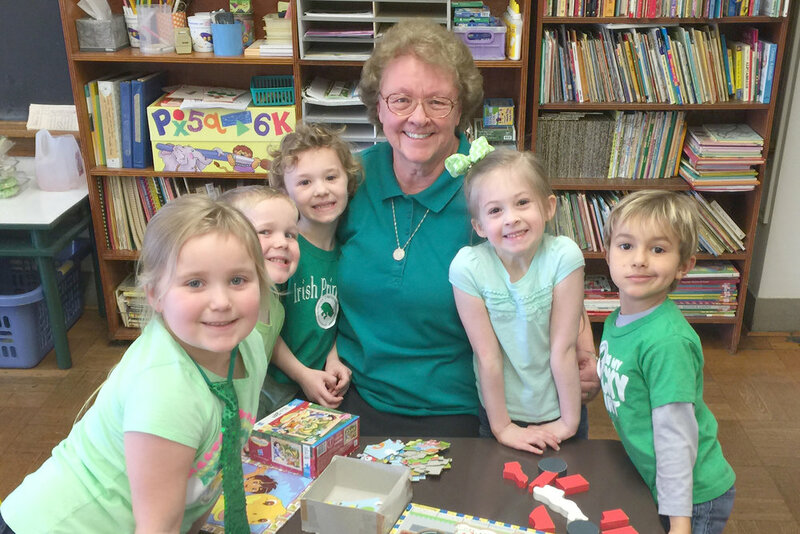 Sister Rosalia Giba, OSF, celebrates Green Day with a group of youngsters at Mount Assisi Academy Preschool. The seemingly quiet nature of convent life is interrupted daily by the chatter of little voices and the clanging of lockers as the youngsters at Mount Assisi Academy Preschool (MAAP) file in and out of school each day in the program that has been providing Christian-based kindergarten-readiness since 1980. A sponsored ministry of the School Sisters of St. Francis, the preschool offers traditional classes for 3- and 4-year-olds, as well as even younger children enrolled in the unique Almost 3 program, which provides an early introduction to socialization and the school environment for those just this side of potty-training. After more than 60 years in religious life with the teaching order, Sister Rosalia Giba has amassed a robust resume of educational experience, including teaching and missionary experience in Slovakia and Chile. All that adventure brought her back to MAAP in 2014 to manage the preschool office. She coordinates student information, tuition payments and fundraising revenue. But her favorite part of her job is interacting with the children and their families. Sister Eve Blostic too is synonymous with MAAP, having taught religion to every single preschooler in the program since the mid-1980s. That’s 32 years if you're counting! Her experience extends back even further, including teaching CCD in parishes and working with children with special needs. HOW TO MAKE A DIFFERENCE: To learn more about Mount Assisi Academy Preschool, visit www.mtassisipreschool.org or call 412-761-0381. 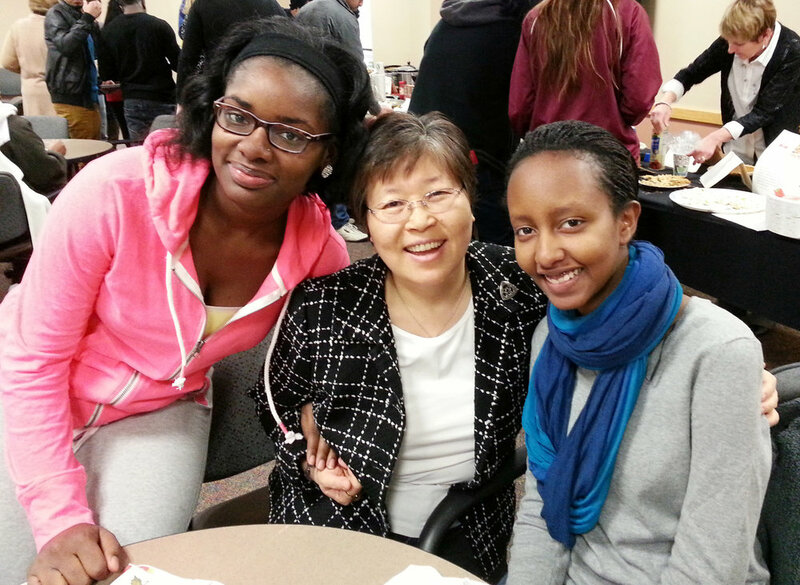 Sister Veronica Kim, CDP, is the Assistant Director of International Student Services at La Roche College. Sister Veronica helps international students with their documentation, implements cultural programs, plans student activities and programs, and recruits students from Korea, all the while providing support to staff and faculty regarding international cultural differences. Sister Veronica's job requires compassion, empathy and sensitivity, as the transition to living at the college can be difficult for international students. Some find themselves homesick while others need assistance with meeting their cultural needs. Sister Veronica Kim is always there to guide the students. She says, "My job requires a lot of flexibility and attention to detail, but it is very rewarding, and I feel like I make a difference in the students' lives and in carrying out the mission of La Roche College." Sister Veronica is making the Providence of God more visible in our world through her ministries. HOW TO MAKE A DIFFERENCE: To learn more about the Sisters of Divine Providence and their ministries, please visit cdpsisters.org. Since the late 1800s, the Benedictine Sisters of Pittsburgh have been living, working and serving in Southwestern Pennsylvania. In 2013, they relocated their monastery from Ross Township to Bakerstown, Pa., just south of Butler. The Sisters wanted to become involved in their new community and, shortly after their move, they discovered the Lighthouse Foundation. Located just a few miles north of the monastery on Route 8, the Lighthouse Foundation is a non-profit organization that helps impoverished individuals and families in the Butler area. People in need can receive help with housing, food, employment, parenting skills and more at Lighthouse. The Sisters chose to volunteer with the food program, so every Friday, you can find several of the Sisters serving breakfast to people who are coming to pick up items at the Foundation’s food bank. HOW TO MAKE A DIFFERENCE: To learn more about the Benedictine Sisters of Pittsburgh and their ministries, please visit www.osbpgh.org. A poster read, “Do you love God enough to serve His people with joy?” To a young girl this question stuck. Now, Alice O’Connell, SCN, serves people in one of the poorest counties in Pennsylvania. She does so with her compassionate presence. She does so joyfully. Sister Alice stood inside her mobile medical van and reminisced about her calling to religious life. She followed her sibling into the convent, but Sister Alice was the one who stayed. “Having that ability to discuss religious life with my sister, to have that support, made it a lot easier,” recalls Sister Alice. She says that what attracted her to religious life is the ability to serve others. Medical checkups, blood pressure screenings, and health education are among the services that local residents of Fayette County, Pennsylvania, lined up to receive in the parking lot of a St. Vincent de Paul thrift store. On a chilly afternoon, a man named Larry had his blood pressure checked by Sister Alice. If it wasn’t for her, he doubts he would have these regular check-ups as his doctor has instructed him. “It is convenient and helpful,” says Larry. Sister Alice has always served in health care. Nursing took her to Edmundite Missions in Selma, Alabama, where she served a large population of seniors. In Pittsburgh, Pennsylvania, Sister Alice was part of a cardiovascular unit at St. Francis Medical Center. Now at Rendu Services, she cares for persons with diabetes, heart disease, addiction, mental health issues, and more. These problems note Sister Alice, usually come with the realities of poverty. Sister Alice uses her outreach to connect with people and show them ways to make changes in their own lives. She uses everyday examples and techniques so people can live happier, healthier lifestyles. Not only does Sister Alice want to provide health care to people, she wants to be a presence to them. At the Rendu Services food pantry, she gives food to families struggling to get by. “Every time you have a problem they try to help you. I don’t know what I would do without the Sisters,” remarked a woman outside the food pantry in Dunbar, Pennsylvania. “People get to know you and that makes a big difference,” says Sister Alice. HOW TO MAKE A DIFFERENCE: For how you can support the efforts of Rendu Services, please visit www.renduservices.org . To learn more about the Sister of Charity of Nazareth and their ministries, please visit www.scnfamily.org. Peacefully advocating for victims and families, Sisters of Divine Providence attend a rally to stop gun violence. This issue is one of the many concerns addressed by the Sisters’ Social Justice ministry, which challenges Sisters and associates to live and work for a more just and peaceful world. Going to the people. Feeding the hungry. Visiting the sick. Meeting people where they are in life. Listening with a caring heart. Treating people with mercy, reverence, respect, and dignity. Working alongside them to help improve their circumstances in life. Being a compassionate and transforming, healing presence. Connecting those who are most vulnerable with the services they need the most — body, mind, and spirit – before needs become emergent. Catherine McAuley, founder of the Sisters of Mercy, dedicated her life in service to others, especially the sick, poor, and uneducated. Catherine’s legacy and the Sisters of Mercy tradition of service continue to inspire the work of the 1,700+ colleagues who work across the many communities that Pittsburgh Mercy serves today. A member of Trinity Health and serving in the tradition of the Sisters of Mercy, Pittsburgh Mercy is a person-centered, population-based, trauma-informed community health and wellness provider and Certified Community Behavioral Health Clinic. As a legacy ministry of the Pittsburgh Sisters of Mercy, we continue to “walk the walk” of the Sisters, who were affectionately known in the community as “The Walking Nuns.” We reach out to help those in our community who are most vulnerable, including those with mental health challenges, addiction, intellectual disabilities, as well as persons who are experiencing homelessness, abuse, and other forms of trauma. We are their community, their safe haven, their safety net. We are mercy. Whether it’s on street rounds, in one of our outpatient service locations, on our mobile medical unit, or in one of our many residential, employment, or day programs, we proudly honor our legacy and carry forward the Sisters of Mercy tradition of service in our work. How to Make a Difference: To learn more about how Pittsburgh Mercy is carrying forward the Sisters of Mercy tradition of service in our community, or to make a donation to Pittsburgh Mercy in honor of its founders, the Sisters of Mercy, please visit www.pittsburghmercy.org. Follow Pittsburgh Mercy on Facebook and pghmercy on Twitter and Instagram. Note: Article contributed by Linda K. Ross, the director of Communications at Pittsburgh Mercy, a member of Trinity Health, serving in the tradition of the Sisters of Mercy. She has worked in Sisters of Mercy legacy ministries for 25 years. In the rich tradition of Catholic social teaching and rooted in the heritage of the Sisters of the Holy Family of Nazareth, Holy Family Institute empowers children and families to lead responsible lives and develop healthy and meaningful relationships built on faith, hope and love. The agency was founded in 1900, when three orphaned children were brought to the Sisters' summer home in Emsworth, PA. From there, the organization accepted many more children who needed care, and in 1931 the organization's name changed from 'Orphan Asylum of the Holy Family' to 'Holy Family Institute' (HFI}. The name change occurred to reflect HFl's shift from being a true orphanage to a small-group living facility serving both orphans and other children in need. Through the years, Holy Family Institute has developed a wide range of programs to help children and families in their communities. Today, the majority of services include educating behaviorally challenged children, counseling and helping families to function as a healthy unit in their homes, preparing youth and young adults for their future through workforce development, offering drug and alcohol addiction counseling to children and youth, and making outpatient mental health counseling available to families and children who are functioning in the community but need specialized help. Sister Linda Yankoski, a member of the Congregation of the Sisters of the Holy Family of Nazareth, has been with Holy Family Institute since 1975 and currently serves as the Institute’s President and CEO. Active in many professional and community organizations, Sister Linda is the Chair of the Catholic Charities USA Board of Trustees and has served on a number of other boards: Mentoring Partnership of Southwestern PA; Community at Holy Family Manor, Pittsburgh; Kearns Spirituality Center, Allison Park; Council on Accreditation, New York; and Families International, Milwaukee. Appointed executive director in 1988, Sister Linda set out to secure national accreditation for HFI, which was granted in 1990. She continued to expand the scope of services provided, introducing special education day schools, an alternative education program, school-based mental health services, family therapy services, and a program offering low-income families assistance with paying energy bills. In 2001, she was named president. In this role, she has continued to adapt in turbulent times, implementing a violence prevention initiative and establishing a workforce development program. 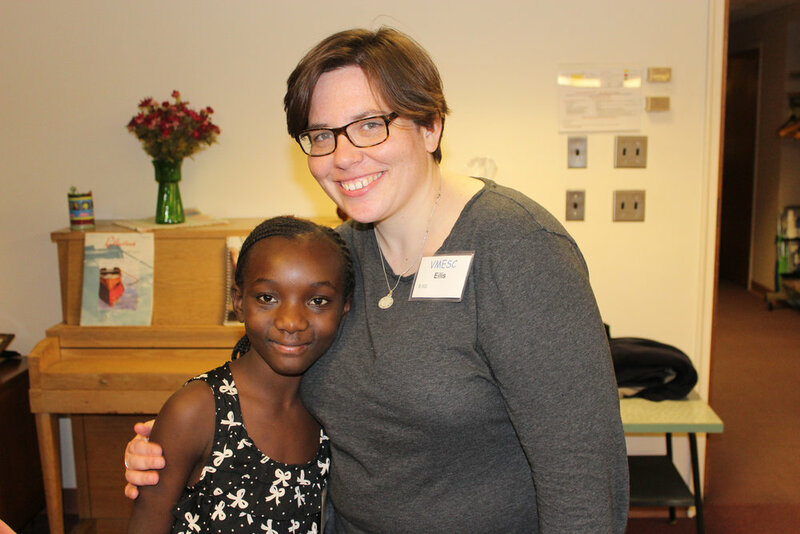 When refugee children came to Pittsburgh following Haiti’s devastating earthquake in 2010, the Institute took in 12 orphans, developing a comprehensive program — including preschool and elementary education — to help these and other unaccompanied children. In 2011, the institute launched an international college preparatory program, through which dozens of international students now live on its campus and study in local Catholic high schools. HOW TO MAKE A DIFFERENCE: For how you can support the efforts of Holy Family Institute please visit www.hfi-pgh.org. To learn more about the Sisters of the Holy Family of Nazareth and their ministries, please visit nazarethcsfn.org. Sisters Theresa and Norma begin their day by walking the streets and alleys in several Pittsburgh neighborhoods. On any given day, Sisters Theresa Margaret Bealer and Norma Rodriguez can be met walking in the neighborhoods of Bloomfield, Lawrenceville and Garfield. They are familiar faces here for bringing kindness and compassion to residents and those they meet along the way in their street ministry. In 2009, the Sisters of the Holy Spirit established a volunteer program to aid the poor elderly of the area. They accompany some to doctor appointments, visit homes and hospitals, cooking and clean for those unable to do so, deliver Blessed Eucharist to Catholic shut-ins, and assist those making transitions in their living arrangements. Sister Norma also provides hospice care, sitting with the dying and giving the families time to be away to relax. She also shares scripture and assists them in knowing Jesus and becoming better acquainted with the Holy Spirit in their lives. Sister Theresa also plans and provides prayer services at wakes for non-Catholics. Both sisters attend wakes and funerals for many people. Through their street ministry, the sisters meet the needs of some of the most vulnerable people in Pittsburgh. HOW TO MAKE A DIFFERENCE: This unique ministry reminds us that there are many people who live alone and have no one to care for them. People can model these good works in their own lives according to how much or little time they have available — perhaps calling or visiting a neighbor or relative who is alone to help them to know they are not forgotten and that they are loved. 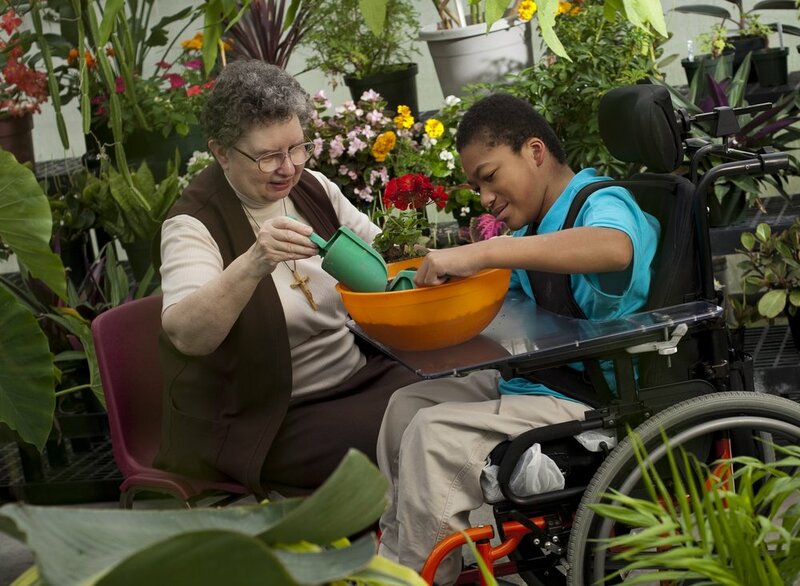 Felician Sister Mary Benita DePace teaches a young man at McGuire Memorial how to plant and water a flower – a relatively common occurrence for most, but an often uncommon experience for many children and adults with disabilities. In a greenhouse built specifically for individuals with disabilities at McGuire Memorial, children and adults can experience what it feels like to smell and enjoy the surrounding plants and flowers, plant a seed, sustain it, and watch something of their own take root and grow—often for the first time in their lives. It is just one of the many ways Felician Sisters are helping to enhance the quality of life for children and adults with disabilities at McGuire Memorial, a ministry co-sponsored by the Felician Sisters of North America and the Diocese of Pittsburgh — serving individuals on the autism spectrum; individuals with profound to moderate physical and intellectual disabilities; as well as individuals who are medically fragile and require 24-hour medical support. For 55 years, the Sisters have unfailingly opened their arms to this very special population, serving individuals ranging in age from 5 to 72 from communities throughout western Pennsylvania. The Felician Sisters’ commitment to the sacredness of all life, together with a guiding philosophy that celebrates and nurtures each life, are the hallmarks of every McGuire Memorial program. “We look at every individual we serve as a gift from God – a gift to be treasured, a gift to be enhanced – as we encourage every individual we serve to reach their fullest potential by providing new challenges, new skills, and new experiences,” said Sister Mary Thaddeus Markelewicz, president and CEO of McGuire Memorial, located in New Brighton, PA.
“At McGuire Memorial, we strive to create an environment where individuals can celebrate their individuality and be encouraged to realize their fullest potential,” said Sister Thaddeus. So whether it is planting a flower for the first time in their lives in the greenhouse; enjoying the thrill of a hay ride on a crisp, fall day; taking part in Christmas celebrations and pageants; or enjoying water sports in a specialized aquatics program – children and adults at McGuire Memorial are given the opportunity to see and experience the world as they might never have before. All of the activities and events offered at McGuire Memorial are carefully and artfully designed to educate and enrich, as well as broaden the life experience, of each and every individual entrusted to the Sisters’ care. The programs are truly designed to help each and every individual live life to the fullest. Today, McGuire Memorial educates, supports, cares for more than 250 children and adults in a diverse range of programs that includes a residential program for individuals with profound, multiple, complex disabilities; the Employment Option Center for adults; a community home program; an adult training facility for individuals with profound disabilities; and The School at McGuire Memorial, a licensed Approved Private School providing individualized special education services for students ages 5 to 21. The Sisters’ founding principles of compassionate care and total availability to all they serve imbue this special ministry of McGuire Memorial, recognized as one of Western Pennsylvania’s premier providers of comprehensive services to children and adults with disabilities -- thanks, in large part, to the tireless guidance and direction of the Felician Sisters. This Felician ministry is a place giving those they serve the gift of joy and gift of living life to the fullest. It is a place giving families the gift of hope and new promise. As brilliant sunlight wafts into the room aboard a mild autumn breeze, Sister Georgette Dublino, OSF strums her guitar to life, and the angelic voices of a small gathering of elders fill the activities lounge at Marian Hall Home in Pittsburgh. It is Wednesday afternoon Scripture Study, a small yet energetic endeavor Sister Georgette began leading last fall. The tender melody of Open My Eyes, Lord streams out the open window, a gentle reminder of the deep sense of spirituality that inhabits the personal care home on the hill in Pittsburgh’s North Suburbs. Even in retirement, many residents at Marian Hall remain committed to prayer and deepening their understanding of scripture. Faith can be as much a part of life as residents prefer at Marian Hall, a sponsored ministry of the School Sisters of St. Francis that has been providing quality care to the elderly since 1970. Sister Marian Sgriccia, OSF is the administrator, guiding a program that prides itself on helping residents to remain as independent as possible. Scripture Study is just one of the enriching activities available to residents at Marian Hall. In addition to favorites like bingo and crafts, residents take part in monthly birthday and holiday celebrations, welcome musical acts, reminisce during memory parties, take part in seated exercise, and even interact with youngsters from the preschool housed in the next building. There’s rarely a dull moment. HOW TO MAKE A DIFFERENCE: To learn more about Marian Hall Home or to inquire about donating to the home's Benevolent Care Fund, visit www.marianhall.org or contact Sister Marian Sgriccia at 412-761-1999. On a bitter cold Tuesday in December, a few of us met at the Sisters of Mercy Convent on the campus of Carlow University in Oakland to assist in making sandwiches for persons served by Pittsburgh Mercy’s Operation Safety Net®, our innovative, award-winning medical and social services outreach to persons who are experiencing homelessness. As we worked assembly-line fashion to spread the peanut butter and jelly, to decide what to do with the end pieces of the loaves of bread, and bag the sandwiches, we discussed the relevance of sandwich making, how it relates to our mission, what it meant to us personally, and what it means to work at Pittsburgh Mercy. We talked about how such a simple task touches and serves so many people who can’t even afford one meal a day. It was as if those 100 sandwiches were like 100 prayers being answered for persons in need. Joe Solomon and I were fortunate enough to go on the pilgrimage to Ireland to see where Catherine McAuley started the Sisters of Mercy. I must say, we always knew why we did what we do but going to Ireland and seeing where it all started brought me back to the roots of why I work at Pittsburgh Mercy. Actually, the pilgrimage was more powerful than I could have ever imagined! We all provide a service for those in need, day-in and day-out but, while making the sandwiches, we reflected on how the Sisters of Mercy took it a step farther by going into communities, helping persons who were poor, sick, and uneducated. I went to Catholic school for 12 years and always saw the Sisters as educators. I never realized until recently that the Sisters of Mercy are not only educators, but they also live the true meaning of being social workers, pioneers in serving those in need in every way. I never felt closer to their spirit. Note: Article contributed by Frank A. Borelli, the senior director of Intellectual Disabilities Services at Pittsburgh Mercy, a person-centered, population-based, trauma-informed community health and wellness provider serving 33,000 individuals annually. He has worked at Pittsburgh Mercy, a member of Trinity Health, serving in the tradition of the Sisters of Mercy, for 10 years. From the motherhouse in Baden, Sisters of St. Joseph can look directly across the Ohio River and see the stark sprawling structure of the Beaver County Jail in Aliquippa. Inside a group of women in lime green jumpsuits appear to be buoyed by the familiar presence of the Sisters and gravitate toward them on this Thursday evening. Amid the activity of television shows, card games, and animated talk in the female pod, Jackie finds her way to Sister Sally Witt, who pulls two plastic chairs together for a “private” conversation. In hushed tones, they speak face to face, knee to knee, hand in hand. “God, faith, spiritual life and prayer are always the heart of our visits. They are paramount in the lives of the women I have spoken to. Their lives have called them to total dependence on God, and they hunger for prayer and for a transformation of their lives,” Sister Sally says. The women have heart-breaking stories to tell. Many have suffered greatly. They are challenged by relationships and finances. They are separated from their children. They are poor and abused. Most struggle with alcohol or drug addiction. 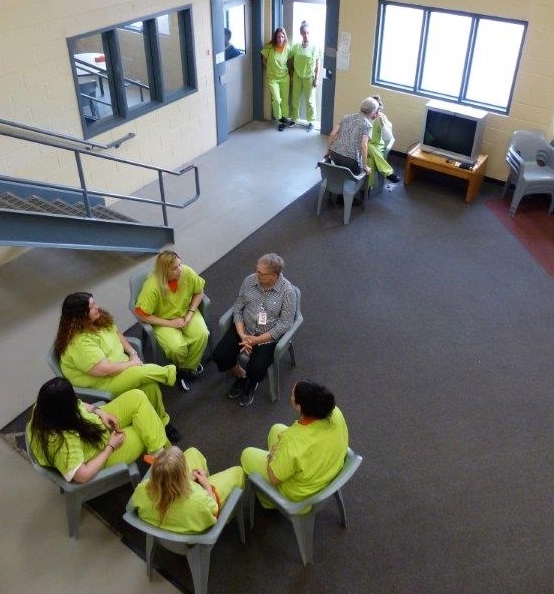 Affectionately called the “church ladies” by the women in jail, 10 Sisters of St. Joseph and an Associate have participated in the visitation ministry at the Beaver County Jail over the past decade. They plan their schedules to help ensure that the incarcerated women can expect a visit from one or more Sisters each Thursday. The Sisters typically meet one-on-one with the women. Some conversations take 20 minutes; others last two hours. In addition to the opportunity to pray with the women, the Sisters say their visits make them more conscious of social justice needs beyond the walls of the jail. Sister Cynthia, a licensed clinical social worker, says she is more aware of how people get caught in a web of violence and self-destruction. She notes that the majority of women are incarcerated for drug offenses, and the opioid epidemic has severely impacted their circumstances. Sister Sally worries, too, about what happens to the women once they are released. “There is not sufficient support or assistance for those who leave jail (or prison), and people are very vulnerable when they come out of incarceration. We need many new programs at the local level, and we need support for these programs at the state and national levels,” she says. HOW TO MAKE A DIFFERENCE: For more information about the Sisters of St. Joseph of Baden, their mission and ministries, please visit www.stjoseph-baden.org. Framed by tropical rainforests in northern Brazil, the beautiful, yet impoverished, municipality of Óbidos is home to a mission of the Sisters of St. Francis of the Providence of God where Sister Marlene Aparecida Avanzi and Carmem Lúcia de Almeida provide medical and pastoral services to over 50,000 persons living in the region. 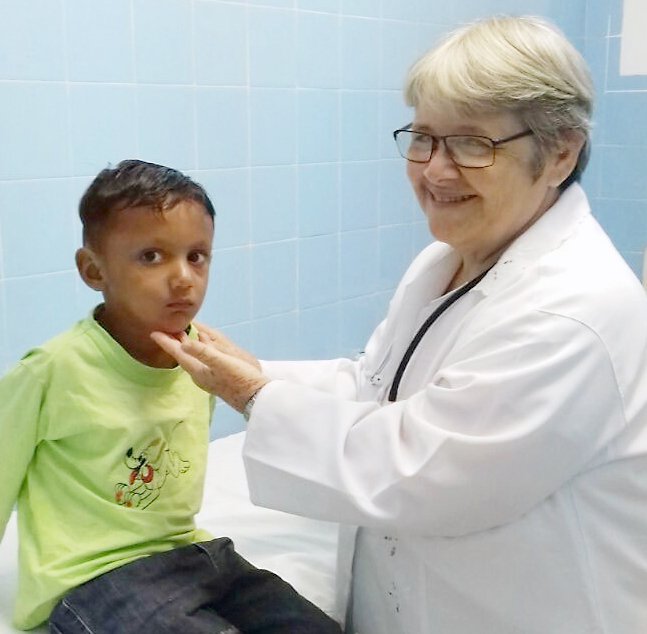 Sister Marlene presently serves as one of three physicians, and the only surgeon at Óbidos’ main hospital and a smaller emergency clinic. Sister Marlene’s presence as a surgeon is invaluable to patients who would otherwise have to travel over 2 hours to the closest hospital for surgery. Situated along the he narrowest and quickest part of the Amazon River, much of the region only accessible via boat. As it is difficult for many to travel to the hospital or clinic for medical care, Sister Marlene regularly visits towns and villages along the river via small motor boat or ferry. Sister Carmem also navigates the river to provide various pastoral services to children and families in need. Traveling on land is also a bit of an adventure for the Sisters with motorcycle or horseback as the preferred method for navigating rough and sometimes nonexistent roads. Once completed in October 2018, Sister Marlene will serve on the Pope Francis Hospital Boat – a collaborative project of the Franciscan Friars of the Providence of God and Alcoa. This floating hospital will provide 100 beds, four surgical rooms and laboratories with remote connections to the best laboratories in São Paulo, Brazil that will enable exam and diagnostics to be made immediately. The boat is also equipped with twelve smaller “ambu-launches” that will be able to navigate narrow rivers and shallow ports where the boat cannot travel. HOW TO MAKE A DIFFERENCE: For more information about the Sisters of St. Francis of the Providence of God, their mission and ministries in the USA and Brazil, please visit www.osfprov.org or contact info@osfprov.org. Sister Linda Valasik seeds parsley in the Villa Maria Farm Greenhouse. The Villa Maria Farm in Villa Maria, Pa., is an integral part of the heritage of the Sisters of the Humility of Mary. It serves as a symbol of the struggle and sacrifice of a small group of women who settled on the Lawrence County land in 1864 and succeeded in establishing a viable, productive farm when others before them had failed. Land management at the farm is based on spirituality, sustainability, simplicity, and the preservation of all local life systems. Home to a greenhouse, two high tunnels, a produce market, a herd of beef cattle and a small flock of sheep, the Villa Maria Farm is situated on 759 acres of land near the Pennsylvania-Ohio border. The farm encompasses 300 acres and includes nine acres of naturally grown produce gardens. And although the sisters no longer do the bulk of the physical labor, their hands are still involved in nurturing the seeds that produce the harvest. The farming ministry helps support the sisters and adheres to the sisters’ mission of bringing more abundant life to God’s people, especially the poor. To that end, half of the food produced is donated to local food banks, shelters, and parishes in Western Pennsylvania and Eastern Ohio. In 2017 the Villa Maria Farm donated 17,000 pounds of produce to organizations like the Lawrence County Women’s Shelter; Neighborhood Food Pantry in New Castle, Pa.; Dorothy Day House in Youngstown, Ohio; North-Mar Church Food Pantry in Warren, Ohio; and Prince of Peace Parish in Farrell, Pa., among others. Partner with us in ministry and help us continue to provide more abundant life for all of God’s people. Donate online at www.humilityofmary.org/support-us and specify farm in the gift designation field or contact the HM Development Office at hmdevelopment@humilityofmary.orgor 724-964-8920 ext. 3291. HOW TO MAKE A DIFFERENCE: Volunteer at the Villa Maria Farm by contacting John Moreira at jmoreira@humilityofmary.org.